BERKELEY—With California’s 2016 rain totals higher than they’ve been in more than four years, forestry experts say our coastal forests are at extreme risk of disease. They warn sudden oak death moves silently through forest and gardens, killing tree after tree where it stands—and death will be on the rise this year. It is the primary cause of tree mortality in coastal California, researchers say, with more than 3 million trees having died already in 15 counties since its discovery in the mid-1990s. Dead trees mean loss of habitat and increased wildfire danger. There is no cure for the disease. The killer pathogen, Phytophthora ramorum, a fungus, is spread by water and air, with rainwater being a major route for disease spread. 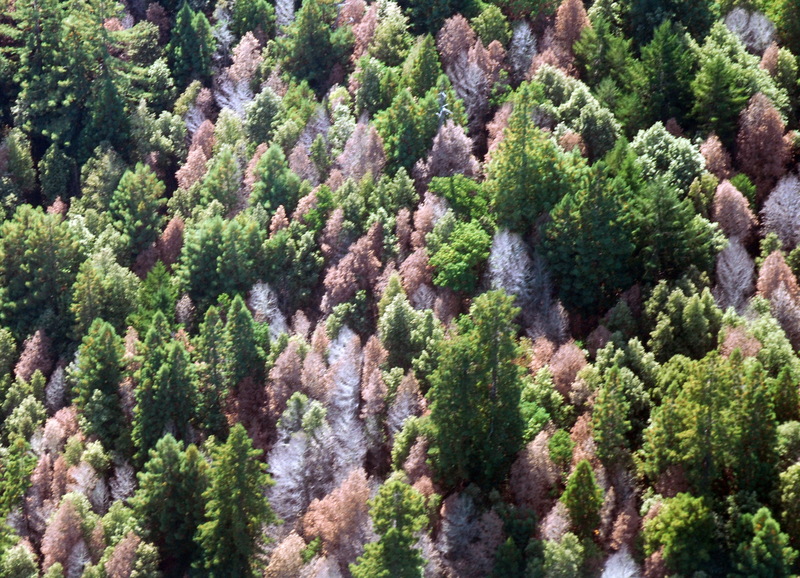 No one is sure how the pathogen got into California’s coastal forests or how to stop its spread. It is killing trees from Big Sur to Humboldt County, with Santa Cruz, Marin and Sonoma counties being particularly hard hit. The pathogen will take advantage of bark wounding, but it’s not necessary for infection to occur. California bay laurel seems to be the main source of inoculum in forests. Green waste, such as leaf litter and tree stumps, are also capable of supporting P. ramorum and acting as a disease reservoir. Because P. ramorum can infect many ornamental plants, such as rhododendron, and can be spread by moving them, experts are calling for the public’s help in locating infected trees and tracking disease spread. Researchers have found infections concentrated around illegal marijuana grows and suspect movement of supplies and soil amendments in Northern California watersheds result in forests with high levels of disease. Hikers, mountain bikers and horseback riders may also help move the pathogen to uninfected areas through contamination of boots, clothes, animals and equipment. With so much at stake, researchers need help with the 10th annual spring SOD Blitzes (citizen scientist surveys for SOD). They hope this year’s citizen surveys will generate record participation. If you live, hike, bike or ride the trails in coastal forests, your help is essential to tracking the disease. “This year is going to be one of the most critical yet for monitoring the more than 500 miles of susceptible and impacted coastal landscapes for SOD,” said Matteo Garbelotto, UC Berkeley faculty member who runs the Blitzes. How to Help: If you live or will spend time in coastal forests, parks or communities this spring, you’re encouraged to participate in the disease-spotting effort. When: Spring 2016, Weekends, April 9 – June 4, 2016. Training: 1-hour training sessions – Required. Cost: FREE — Attendees should bring mobile devices or GPS units if they have them. Symptomatic California bay laurel leaves generally precede oak and tanoak infections, and are often the first sign that P. ramorum is in a location. Participants will be trained to identify and collect symptomatic bay leaves and record sample locations. Volunteers are encouraged to bring their smartphone to the training with the free “SODmap mobile” app already installed (SOD distribution map of laboratory-confirmed positive and negative samples in California, not including nurseries) as it can help in identifying potential collection locations. Blitz samples will be taken to the UC Berkeley Garbelotto lab to determine the presence or absence of the pathogen. Results will be posted online in the fall to SODmap (www.SODmap.org) and to the SODmap mobile app (www.sodmapmobile.org). When used as instructed, these two tools will help inform thousands of people as to the presence and risk of SOD at a given location. SOD Blitzes are made possible by the work of local volunteers, along with funding from the PG&E Foundation and the USDA Forest Service, State and Private Forestry organizations. SOD Blitz volunteers gathering suspect leaf material for lab analysis. Photo courtesy California Oak Mortality Task Force. “Not only do these volunteers provide invaluable data for the fight against SOD, they also help lead the charge in proactive SOD management on private property, with Blitzers 10 times more likely to actively manage their properties, collectively helping to slow disease spread,” Garbelotto said. For more information on SOD Blitzes, go to www.sodblitz.org. For more information on Sudden Oak Death and P. ramorum, go to the California Oak Mortality Task Force website at www.suddenoakdeath.org or contact Katie Harrell at (510) 847-5482 or kpalmieri@berkeley.edu.